We’re told “clean” energy is a viable and cost effective. But cut the government subsidies, and 97 percent of investors vanish (in Australia it’s collapsed from $2.6b annually to $80m). The truth is that renewables are almost totally dependent on taxpayer largess. No wonder they lobby like their life depends on it. It does. “Australia’s investment in renewable energy all but dried up in the first half of 2014 amid uncertainty fuelled by the government’s latest review of the mandatory target, according to Bloomberg New Energy Finance. In the six months to June, just $40 million was invested in large-scale renewable energy, such as wind farms, the lowest level since the first half of 2001, according to Kobad Bhavnagri, head of BNEF’s Australian unit. One oil and gas worker is worth 10 renewables workers, not that the ABC will say so. Today ABC online reports that “Mr George says 24,000 jobs are at stake – almost as many jobs as in the oil and gas industry.” Miles George is the managing director of wind power firm Infigen Energy, and chairman of industry body the Clean Energy Council. Obviously, he’s out to drum up sympathy for his industry. ABC “resources” reporter Sue Lannin didn’t mention that those 24,000 people in the renewables energy sector provide only 6% of our total energy needs, while 24,000 or so in “oil and gas” provide 60%. The photo chosen for the story on the poor plight of 24,000 not-very-useful workers subsidized by the taxpayer is this sunset shot of wind-turbines, where the turbines are almost the same color as the sky behind them. The caption implies Joe Hockey is being unreasonable thinking these almost invisible towers are “offensive”. The ABC reported the fall in Australian renewables investment as if everywhere else in the world was doing the opposite. They didn’t mention that Europe is in the grip of a coal boom, or that Germany is cutting its renewable subsidies, as well as their RET (from 30% to 27%). Spain is retrospectively capping its renewables subsides, lopping 40% off the earnings of its largest solar operator. There were public protests about electricity prices in Bulgaria that were so bad, the government is demanding some subsides get paid back! Our public funded broadcaster provides third party free advertising for the renewables industry. Mark Colvin made out that investment is “soaring” everywhere except Australia, but doesn’t mention that overall, renewables investment is lower today than it was in 2011. ABC listeners come away misinformed. “MARK COLVIN: A new report shows investment in renewable energy is soaring around the world. But the opposite is true in Australia. The report by Bloomberg New Energy Finance says China and the US led a total renewable investment pool of $63 billion in the last three months. The money mainly went into wind and solar projects. By contrast just $40 million was invested in renewable projects in Australia – the lowest total since 2001. An ABC listener would never know how many other countries are pulling out of renewables, because neither ABC journalist David Mark or Mark Colvin asked hard questions of the Bloomberg “New Energy” Finance corp, or the Clean Energy Council representative. “DAVID MARK: What do you put that down to? KOBAD BHAVNAGRI: This is almost entirely, in fact this is entirely due to the Coalition Governments review of the renewable energy target, in which it’s considering options to lower the target or scrap it all together have put the complete brakes on investment in the sector. No one is prepared to invest dollars and put shovels in the ground in a policy that maybe torn up all together. DAVID MARK: What does that say Kobad Bhavnagri, that countries like the United States and China, which were the ones which were seen to be dragging the chain on action on climate and also on renewable energy are now leading the way and yet Australia has almost slowed to a halt? KOBAD BHAVNAGRI: Yeah will it shows that Australia on the policy front is really now going in a direction that’s counter to the rest of the world. For a long time there’s been a perception created that Australia was really leading the pack and that the rest of the world in particular China and the US were going slower and we were putting our neck out in front. The Clean Energy Council are an industry body here to sell their goods. Apparently we pay the ABC to do no background research and ask no hard questions. “DAVID MARK: Kane Thornton is the acting chief executive of the Clean Energy Council. KANE THORNTON: What that means is that projects have approval, there’s a lot of exciting projects right around the country that are ready to go, but those businesses can’t really get those projects financed, they can’t go ahead with them while there is so much uncertainty about the policy that really will provide the revenue to pay off those projects in years to come. DAVID MARK: Kane Thornton says the uncertainty in Australia over renewables flies in the face of what’s happening internationally. Time to privatize the ABC. It does not represent taxpayers of Australia. h/t to the GWPF and Climate Depot. You’re just yanking our chains for schnitz n giggles, right? Aaron, is there a mathematical relationship? Does a 97% “consensus” = a 97% subsidy? Could be. (Give me a grant, I’ll look into it). Climate alarmists are obviously obsessed with the 97% figure. Here lies a 97 percenter, a true believer in bad science and statistics and a firm advocate of expensive unreliable energy to solve a non-problem. Someone may forgive him, but those of us living in energy poverty will not be amongst them. The really sad thing is that 3% of the alarmists, don’t understand why they are alarmists, but they will fight to the minor inconvenience to prove how loyal they are. I suspect that a 3% conservative vote is the aim of socialist. 97% consensus? What was the question? JN you are too greedy! I Want That Grant!! Hijacking because I am on topic! Bjorn Lomborg bemoans Copenhagens folly of wanting to be the first major carbon-neutral city (whatever that really means), and the associated costs. Sorry, no dice. Detroit beat them to it. I would suspect that DECAY releases far more real pollutants than life. Its like its appearing everywhere in nature! Sure there must be a correlation between 97 as a percentile and 1.618!!! That’s a perfect analogy. For banks and renewable energy schemes, 97% is their golden ratio. I can see a “The number 23″ style of movie based around this, maybe get Ed Begley Jr to play the lead? 0.97 is the 16th root of 0.618 if that’s any help! very much part of the amorphous GREEN BLOB !! We all noticed your hair was green, before you died it blue. ….not the oozing green ectoplasmic slime that is associated with the GREEN BLOB and its minions. ! Did anyone else catch the ABC Sunday morning when someone sensible commented on renewable energy? He even said words to the effect of “a bit like the bicycle won’t replace the car, renewable energy is not ready to replace fossil fuels, it’s just a bit of a supplement when the weather is right”, and “our modern society needs a regular steady supply of energy, and renewables can’t provide it. Sorry I can’t be more specific, as my attention span for radio chatter is short when I am on the highway. Perhaps someone else has a reference. ….the beginning of the U turn for the ABC???? Yup the taxpayer has funded the construction of windfarms that are then handed over to the generator who commissioned the construction. From there they sell half or more of the asset to another generator and turn tax payers money into free cash, then if they stay in the asset, they get basically free power to sell into the market at inflated prices via charging the end user extra through “green energy” fees on the final bill. The term “nice work if you can get it” was never so true as it has been in the construction of renewable energy projects in Australia. The one thing you will never see is generators pass on any of the massive windfall profits they have made via the RET and fleecing green energy suckers. I guess the prime example would have to be Geodynamics, from the heady days of a share price over $1 when tax payers money was being pumped in, to 4.7c today, now the reality of the true generation potential is understood by investors. By the way, if anyone is interested in making a contribution, I have discovered a way to generate electricity from harnessing the power of a bunch of hippies sitting around a campfire, smoking pot, singing koombya and kidding themselves society can function if we all follow join them. If you would like to invest, please visit the only website in Australia powered by 100% delusion energy http://www.greenenergysucker.com.au . Indeed. I thought I would demonstrate the potential of delusion power to run a website. For some reason its not working ?? One thing you forgot. You must have a 97% consensus to generate delusional power to any significant extent. The remaining 3% must also be ignorant of the nature of the consensus or the delusional power generated by the consensus is dissipated as only an addition to global entropy. Since you can’t fool all the people all the time, no useful work can be done with delusional energy no matter how much is generated. Bob Hawke, the quintisential lefty socialist was the first to bang on about consensus along with arbitration – the only time he never used it when dealing with unions to negotiate a free ride for them against employer oppression was the pilot’s strike when he broke the back of the pilot’s union by threatening to use RAAF pilots. But, if you Google “Green energy sucker”, you get 2,300,000 hits. In a recent article on The Conversation, University of Melbourne Professor Emeritus Frank Larkins wrote that Australia’s targets to increase renewable energy will make electricity more expensive, thanks to problems with consistency and storage. Moving to 100 per cent renewable electricity is safe, technically feasible and affordable. It can cut greenhouse gas and other emissions and land degradation, while creating local jobs and energy security. It is ready to go! I am surprised that Assoc. professor Mark Diesendorf cites Germany as a paragon of renewable energy. Over the last decade, well-intentioned policymakers in Germany and other European countriescreated renewable energy policies with generous subsidies that have slowly revealed themselves to be unsustainable, resulting in profound, unintended consequences for all industry stakeholders. Fortunately [sic] there is still available BZE’s Stationary Energy Plan which declares that Australia can run entirely on renewables by 2020. This dross is critiqued by Martin Nicholson and Peter Lang. Former Secretary of State and U.S. Senator Hillary Clinton is scheduled to deliver the keynote address at the conference. Reid on Monday announced a panel discussion on climate change and business will feature Murren, former U.S. Ambassador to China and Utah Gov. Jon Huntsman, and former federal housing secretary and San Antonio, Texas Mayor Henry Cisneros. ***so funny given CAGW sceptics’ Heartland’s 9th International Conference on Climate Change just took place at the Mandalay! Weather reporters also in full flight, likely repeating the output from the Bureau of Meteorolgy. Those of us who live in Melbourne seem to be agreed that we have just lived through one of the coldest July months in living memory, accompanied by record snow falls on the ranges. Comment by the Weather girl was that the coldest morning this July was 4.9C. However apparently we should on average have had 2 mornings below 2C in July. By implication our July has been warmer that average. we have just lived through one of the coldest July months in living memory, accompanied by record snow falls on the ranges. Nonsense! This July has been the warmest July since records began… just ask the BOM. Not here we haven’t. For the first month in perhaps two years the BOM tells us we are about 1 degree below the long term (note that that goes all the way back to 1990) average, for both maximum and minimum temps. However for the remaining week of July the days are already noticeably longer, so that might catch up. Apparently temperature records prior to 1990 are not admissable because they were recorded with inferior equipment. 1990 is the “long term” if your a warmist. I mean lets face it, these people are happy to attempt the science equivalent of reconstructing a dinosaur, complete with skin colour from the last vestiges of 0.5% of a toe print in soft sand. The delusion that the amount of data we have on climate is in anyway enough information to identify or predict trends is somewhere between narcissism and madness. I think that Piltdown Man is a better analogy. Down here in Tasmania (Disclaimer: In light of Mz Lambie’s recent comments regarding the well-hung nature of her preferred provider, I wish to make it clear that I am not from here, I just live here) it has been the coldest June/July since I have been here. The locals I talk to are agreed that this has been the coldest start to a winter for many a year. Local carbon traders, otherwise known as firewood merchants, tell me they can’t keep up with demand, in this, our ‘hottest’ winter on record. You should put a copyright on that one! The “Heat exaustion” ward at Melbourne Hospital is full. Try and book a spot if you can! The Melbourne weather station should be ignored as a complete outlier due to the urban heat effect. Record high temps will continue to be broken as the density of the CBD increases. Up here in the bush our average temps are a full degree lower than average and that is after the BOM truncated most of our historical records, sorry, homogenised. I’ve lived in a north western Melbourne suburb, Niddrie, for 55 years and was born in Essendon and lived there from 1937. I experienced more much hotter summer days than any over the last 40 years,including the recent “record maximums” the BOM fabricates. Thought I must be getting a bit old because I’ve never felt it so cold as this winter but confirmed with the missus that this sort of miserable winter is typical of the sort of winters we experienced when we were youngsters. Climate change for ignoramuses but for those with adequate experience just cyclical, she said and who am I to argue with her? The issue was slightly oversubscribed, with the offer price set at 1.70 euros, at the bottom of the price range.At 0830 GMT Anemos shares were down 5.9 percent at 1.6 euros, underperforming the Athens bourse general index, which was down 0.6 percent. Anemos, a unit of Greece’s biggest construction group Ellaktor, is a mid-sized renewable energy producer that operates 12 wind parks, a solar plant and a hydroelectric plant with 170 megawatts in total installed capacity. PPC said these changes will have no major impact on consumers and underlined that energy cost in Greece remained one of the lowest in the European Union. The dispute reached a boiling point recently with windpark opponents suspecting green energy activists of poisoning birdlife in order clear the way for an unobstructed windpark permitting. Unfortunately outputs promised by wind turbine manufacturers and proponents have fallen short of expectations. Moreover, high maintenance costs have in many cases eliminated profits and resulted in losses for investors. As generous as the subsidies may be, profit from wind can be elusive. Germany’s Habitually AWOL Green Energy…Installed Wind/Solar Often Delivers Less Than 1% Of Rated Capacity! Reality is that it is very bad news environmentally if we are facing lower temperatures and perhaps a Dalton type minimum or much worse a Maunder type minimum. And it is right on the Russian climate scientist Habibullo Abdussamatov’s time line of a substantial fall in global temps and the the start of the next multi decade cold period in 2014. We will wait and watch as that is all we can do other than a massive program of building new fossil fueled and nuclear power stations to be able to provide adequate living conditions across all the Northern Hemisphere’s higher latitudes if and when the cold decades set in. What stupidity takes hold of some narrow limited intellects that imagine that a sometimes on, sometimes off, 6 to 8 hours maximum generation capability can be used to power a 24 hours a day, seven days a week civilisation of 7.25 billions of humanity?. The construction of the photovoltaic power industry since 2000 has required an enormous amount of energy, mostly from fossil fuels. The good news is that the clean electricity from all the installed solar panels has likely just surpassed the energy going into the industry’s continued growth, Stanford researchers find. While solar is a far less polluting energy source than coal or natural gas, many panel makers are nevertheless grappling with a hazardous waste problem. fuelled partly by billions in government incentives, the industry is creating millions of solar panels each year and, in the process, millions of pounds of polluted sludge and contaminated water. To dispose of the material, the companies must transport it by truck or rail far from their own plants to waste facilities hundreds and, in some cases, thousands of miles away. The fossil fuels used to transport that waste, experts say, is not typically considered in calculating solar’s carbon footprint, giving scientists and consumers who use the measurement to gauge a product’s impact on global warming the impression that solar is cleaner than it is. After installing a solar panel, “it would take one to three months of generating electricity to pay off the energy invested in driving those hazardous waste emissions out of state,” said Dustin Mulvaney, a San Jose State University environmental studies professor who conducts carbon footprint analyses of solar, biofuel and natural gas production. The good news is that the clean electricity from all the installed solar panels has likely just surpassed the energy going into the industry’s continued growth, Stanford researchers find. It seems to be worse than the quote above leads you to assume. So at the the current time solar has only begun to support it self energy wise but will have increase CO2 earlier than would have happened without it for another decade yet. That being true if the power provided by it has been correctly calculated. Tony from Oz may have a differing opinion. There is no mention of how that is heavily due to subsidies and may fail without them. Considering the net increase in global CO2 that has been caused by the Solar industry for the next decade, I would like to thank it anyhow for attempting to make the pause in global warming flat instead of cooling! I should have included a very. very large bolded [ SARC] in that #10.1 solar panel post claim. As I have posted before; How the hell do the solar promoting carpet baggers and the intellectually and responsibility challenged politicians expect to power a 24 hours a day, 7 days a week, 52 weeks of the year advanced , industrialised civilisation with a few hectares of grossly inefficient at 15 % or so practical efficiency, highly polluting during production, solar panels that only get an unpredictable and intermittent 6 to 8 hours sunshine every 24 hours to turn into useable energy for this energy intensive and energy dependent industrialised 24 hours a day civilisation.. Stupidity does, only exceeded by intellectually challenged politicians handing out immense amounts of OPM as subsidies to the carpet bagging solar promotion industry without ever having any fully proven, verified, scientifically supported base to justify their grossly indulgent handouts of tax payer’s / OPM to these carpet baggers of the solar and wind energy industries.. So when the British inventor Thomas Savery (1650-1715) invented the first crude steam engine in 1698 and other British inventors then rapidly developed and refined those crude coal fired steam engines into reasonably reliable power sources, thus creating the requirements for the great British Industrial Revolution which even today is still the basis for our entire society and industry and economy and even political structures, the British followed closely by the Germans, got the hell out of wind energy just as fast as they could. Wind was so unpredictable and so unreliable and solar didn’t even exist except to create wood to use and burn that the Industrial Revolution would never have happened if mankind still relied on wind for his energy needs. Yet the grafters and rip off merchants of the wind and solar industries aided and abetted by the pure ignorance of the intellectually challenged , fairies at the bottom of the garden believing green cult plus some politicians who haven’t a clue about what constitutes reality against a deliberately created fear inducing, societal destroying driven agendas now want to take mankind back to a system of energy production that those who used it three hundred years ago, for very good three thousand year old experience based reasons got the hell out of wind energy just as fast as they could mine that coal and shovel it into those very crude and dangerous steam engines of these early industrial revolution times. Thomas Savery was an English military engineer and inventor who in 1698, patented the first crude steam engine, based on Denis Papin’s Digester or pressure cooker of 1679. Thomas Savery had been working on solving the problem of pumping water out of coal mines, his machine consisted of a closed vessel filled with water into which steam under pressure was introduced. This forced the water upwards and out of the mine shaft. Then a cold water sprinkler was used to condense the steam. This created a vacuum which sucked more water out of the mine shaft through a bottom valve. Draw your one conclusions but I think the big pull back from the economically, industrially and societal unsustainability of renewable energy is fast leading to a political unsustainability across most of the developed world for the renewable energy industry. A token renewable energy industry will remain until it is worn out and becomes uneconomic even with heavy subsidies as the renewable energy promoting politicians will have far too much egg on their faces and have to face the opprobrium of their electors if they admit they have made a major FU of policy in subsidizing and promoting renewable energy. “Over the last decade, well-intentioned policymakers in Germany and other European countries have created renewable energy policies that have slowly revealed themselves to be unsustainable, resulting in profound, unintended consequences for all industry stakeholders,” reads FAA’s report which was prepared for the Edison Electric Institute and other European groups. “Accordingly, the United States and other countries should carefully assess the lessons learned in Germany, with respect to generous subsidy programs and relatively rapid, large-scale deployment and integration of renewable energy into the power system,” FAA warns. Germany was once touted by President Obama as a shining example of green energy policy. The country aims to get 80 percent of its power from green energy by 2050 in an effort to drastically cut its carbon dioxide emissions, which scientists say cause global warming. A mix of subsidies and production quotas have allowed the country to rapidly expand its green energy production, growing from 4.3 percent of total energy consumption in 1990 to a whopping 23.5 percent in 2012 (this includes hydroelectric power). But the cost has been astronomical to consumers. Consumer energy bills have been spiking for years to the point where electricity in the country has been called a “luxury good” by major media outlets. German households have seen electricity prices more than double in the last decade “increasing from €0.14/kilowatt hour (kWh) ($0.18) in 2000 to more than €0.29/kWh ($0.38) in 2013,” according to FAA. This is compared to U.S. household prices, which have been stable at $0.13 per kilowatt hour over the last decade. FAA also reports that German consumers will pay $31.1 billion for energy subsidies this year alone. Furthermore, in the past five years Germany has suffered $67.6 billion in net export losses from high energy costs — a huge blow to an export-led economy like Germany. Rom, I’m guessing you are not keen on Solar then? Heavily subsidised solar panel energy generating installations in direct competition with unsubsidised base load generators PLUS the Government mandated requirement that any Renewable energy ie solar and wind, generated MUST have priority to supply over other forms of energy generation regardless of extra costs or any other factors is a complete negating of the basic market forces accepted by our society, market forces that create continuing gains in efficiencies and reduction in costs and which will define the types and costs of the product the consumer wants and will thus purchase. Stop all subsidies to wind and solar and withdraw all legislation that mandates the use of renewable energy before any other forms of energy can be sold to the consumer. In short, now that we have smart meters which makes this possible, give the consumer a choice of if and when they want to be supplied and pay for renewable energy and then let the market forces, the consumer decide as to just what they want in energy generation systems and how much they are prepared to pay. Under those conditions I have no problems with solar power generation as it can be relatively inconspicuous and will find it’s own niche and level of usage. That would have to be one of the worst of any power generation system devised from the points of unpredictability, variability, stability, human health from infra sound created psychological damage [ about 20% of people in close vicinity to turbines suffer mild to very severe symptoms and health debilitating symptoms from turbine blade generated infra sound ] devastation of biological systems such as an almost complete wiping out of bat colonies in the vicinity of a wind turbine farm, massive and carefully hidden bird kills, [ both anecdotal from within the turbine industry ] a blight upon any scenic views where turbines have been built, a debacle in efficiency when the amounts of power produced is measured against the costs involved in building . wiring and maintaining the turbines against power generated and etc and etc. And then to top it off, the very reasons for wind turbine power generation, the reduction of CO2 emissions now after a number of analysis of the CO2 emissions against power produced, there seems to be rough agreement that there is about a miniscule 2% [ two percent ] of savings in CO2 emissions if that. Some Danish research [ Denmark is the home of wind turbine manufacturing ] suggests that wind turbine systems including the inefficient idle running of fast reaction, back up fossil fueled generators increases CO2 emissions over and above a high efficiency latest technology fossil fueled base load power station. I reckon this is worth a post of its own! What I want to know is how much of the electricity produced was completely wasted and how much actually ran appliances, recharged batteries and powered light bulbs when there was no alternative source which would have done this anyway? My hunch is almost 100 percent for the former and near enough to zero for the latter, putting aside the miniscule amounts for freestanding applications such as garden lighting. For the first half of 2014, China’s coal imports stood at 159.87 million metric tons—an increase of 0.9% from the same period last year. However, in June, coal imports stood at 25.05 million metric tons—depicting a 4.3% and 12% increase month-over-month (or MoM) and year-over-year (or YoY), respectively. For the rest of 2014, China’s seaborne coal trade should increase towards the winter and summer, when electricity consumption is high. This may support the dry bulk shipping companies like DryShips Inc. (DRYS), Diana Shipping Inc. (DSX), Navios Maritime Partners LP (or NMM), Navios Maritime Holdings Inc. (NM), and Safe Bulkers Inc. (SB). The major problem with coal, that China has, is getting it from where it is to where it is required. High stockpiles of coal at ports and rail-heads but generator plants, over a very wide area, are running low. It’s mainly a transport infrastructure problem that the Chinese knew about before it really started to hurt. Sorry no link I read about this more than a year ago. well, it looks like our coal exporters should be talking to India right now! Generating subsidies, certainly – but electricity..? Not a cat in hell’s…! There is potential for the further development of wind turbines in Spain given the extensive amount of coastline it enjoys. Certainly the prospect looked good as Spain was the first country to introduce a variable premium system for wind energy and the first to provide bonuses for systems able to supply reactive power to the grid to assist with grid reliability and stability. However, there is a twist in the tale. Although the Spanish government is keen to publicise its sustainable energy image there are also indications that the policy is feeling the pinch. Renewable energy doubled between 2006 and 2012 but the cost to the government was high. By 2012 subsidies to all renewables had reached €8.1 billion, [ AUD $11.4 billion,; Spain's GDP is almost identical to Aust; Aust Population 22.5 million versus Spains 47 mill pop. ] a level of support that was in itself unsustainable. The crippling tariff deficit that resulted was, according to Forbes, partly the result of the very low rates that consumers paid and the actual cost of generating and distributing power. As a result, subsidies to solar power are being reduced and consequently we are seeing a stalling of the growth which was evident in 2008. The cost of fuel is being passed on to the consumer who is meanwhile wondering what has happened. In 2012 a 7% tax was introduced on all electricity sales in Spain both conventional and renewable and there has been the gradual reduction in subsidies and incentives. There has been outrage from some quarters as rather than encouraging the use of solar power the Spanish government appears to be penalising those who have installed it. Those people who create their own energy will be charged a fee for doing so. Some people invested large amounts of money in solar panels in Spain only to find the revenue from their investment depleting. “97 percent of Australian renewables investment dries up without subsidies”. Enough said. We the Aussie tax payer have been bank rolling the “renewables scam” for years now. Renewables [RE] are a passport to misery – just look at the EU where the “large scale RE experiment” has resulted in total & utter economic misery. And the”decarbonisation exercise” has been totally unnecessary in any case because CO2 emissions don’t cause GW, GC, Climate Change …nothing at all except that “plant life” thrive on the extra CO2 us Homo Sapiens manage to pump into the atmosphere. Do the Greenies acknowledge this? Of course not. Their idealogy can only bring great pain to planet Earth’s citizens who should by now realize that ‘Green Doctrine” is very very bad. Hasn’t the ABC staff superannuation fund been invested in green schemes? Poor buggers are just flaffing around trying to protect their retirement nest eggs. That has been a common mem over the last several years. I think the BBC is more invested than the ABC though. I remember Joe doing a blog post back around Christmas this year listing the ABC investments. They were mostly oil, coal, iron, insurance ect. Some green, but on the whole not a lot. Ok, I don’t know what JoNova is short for, Joanne?. Yea, I wasn’t thinking. If a product supplies value or perceived value to the consumer – it will sell. There is no need for artificial external interference into the simple supply and demand equation that has worked in markets for centuries. Nor any need for a big ‘Advertising and PR Agency’ called THE ABC to use taxpayer funds to sell a product that does not work efficiently or provide true value without needing to be propped up by subsidies. “Clean Energy” is a carefully crafted phrase. Why not ‘Taxpayer-Subsided Energy”? “The guy down the street has solar panels, and he gets this big smirk on his face whenever he gets his taxpayer subsidised electricity bill, the greedy [expletive deleted]“. It is what the Greens would do, in a similar situation. Now that’s a 97% I can believe in. Next — the other 3%! Investment in renewables may be drying-up in Australia, but it continues to grow at phenomenal rates in the UK. As a result, subsidies to renewables are growing at 30% year-on-year. The biggest growth is in off-shore wind turbines, which receive about £96 ($170) per megawatt in subsidies. I suggest you guys have a read of this article by Euan Mearns at Energy Matters, in particular the 5th & 6th Graphs which put the approximately $1.66 Trillion (US) world investment in renewables in to perspective. In the EU the focus will be on EESS. When I was nowt but a lad I used to think it would be a great wheeze to give everyone 150,000 GBP when they reached majority. The principle being that they would save or spend the money and it would all go round and round. Maturity – and a few friends told me this was not a goer. But hey! That’s now become real: I can easily employ 24,000 people: 12,000 to dig the holes – and another 12,000 to fill ‘em in!! And the ‘government’ pays. What is the difference? This economics lark is easy, isn’t it? I saw a BBC drama the other day, one scene of which prominently featured a number of wind turbines almost all of which were stationary. This must be the first time ever I’ve seen that on a BBC programme – to the extent that I had assumed that there was a policy against showing such a thing and/or, at least in fiction, CGI was used if necessary to keep them all turning. This report tells us that many many countries right around the world are pushing very hard to move away from coal and from gas for their electricity generation and move towards renewable energy, because that’s what’s the most cost effective increasingly in those countries and that helps them to reduce their emissions and transition their energy sector. If this advice was given by a financial adviser, to a potential investor, that adviser could be sued. But when it is given by a Government employee to support policies that will make millions worse off there are no comebacks. Kane Thornton heads the Clean Energy Council which is the industry body for renewables. Don’t mix them up with the Clean Energy Finance Corporation. (Which is easy to do). I don’t think the CEC gets government funds – at least their “about” page implies they are funded by memberships — though most of their members are presumably dependent on government help at some level. Theoretically, they are “independent” — except of course, no renewable company wants small government or less corporate welfare. It’s not like they would ever prefer open competition, is it? Only took these watermelon idiots 22 years from Rio Summit to figure out that Enron/Gore carbon trading is a scam. A UN-backed conference in Venezuela has ended with a declaration to scrap carbon markets and reject the green economy. “The declaration also conflicts with the UN’s own schemes to tackle climate change. It says carbon markets are a “false solution” to the problem of climate change and brands a UN-backed forest conservation scheme “dangerous and unethical”. In any event, what utopia would be complete without a complete paralysis of the one sector that traditionally serves as the backbone of any functioning economy: no, not makers of iPhone apps… manufacturing. Treasury reference modelling showed that without a carbon (sic) tax, manufacturing was expected to grow more slowly than the rest of the economy, by about half a per cent annually to 2020 in real terms. Now I get it, but, will Venezuela? The way to get manufacturing businesses going is to tax them more heavily. If the carbon tax does that then why not double it? “NINE out of 10 jobs in the manufacturing sector are in firms that will face the full impact of the carbon tax. So much angst over subsidies for wind power. Yet no crocodile tears when nuclear plants are heavily subsidized. In fact, no nuclear plant would be built without subsidies. The thing is, Roger, that nuclear plants supply reliable electricity and pay for themselves admirably. I don’t think you would have any trouble finding investors. What can you say for wind power? I say, because it is true, that nuclear power cannot compete with wind power. Several nuclear plants in the US are losing money badly and have either announced their shut down or have run crying to the government for subsidies (yet more subsidies). Nuclear plants do not pay for themselves admirably, not at all. They hide their exorbitant costs of production in a huge customer base. As for trouble finding investors, tell that to the Indians who could not get a Russian bank to finance the plant – so the Russian government stepped in to finance it at below-market rates. Would you call that a subsidy? Tell that to the state of Georgia (US), where the Vogtle plant under construction is only viable because the state government (for the first time ever) passed legislation to force utility customers to pay in advance for power they have not received while the nuclear plant is under construction. That Vogtle plant also enjoys a huge US government loan guarantee of several billion US dollars, and of course enjoys all the unlimited protection of nuclear disaster liability under the Price-Anderson Act. As I wrote, without enormous subsidies, nuclear power would not exist. It cannot compete on its own merit. The nuclear advocates have glossed over that fact, for decades. The only reason nuclear power is expensive is simple: the costs incurred by the nuclear power industry in dealing with green opposition. Between red tape, court costs and the attendant delays that contribute to the aforementioned costs, the expenses associated with the construction of nuclear power plants becomes untenable. This is exactly what the greens want. It goes glove in hand with their game plan to make anything but the party approved sources of energy so expensive that even alternative energy in general, and wind and solar in particular, appear to be a solution to our energy needs. If wind and solar power were attaked by the greens with the same vigor they attack nuclear power with then the cost of alternative energy would be astronomical. Radical enviromentalism is the greatest threat to economic growth the world faces today. If you want to see robust economic growth then put all the greens on an isolated island where they can practice what they preach and let the rest of the world enjoy the prosperity earned by the fruits of man’s labor. How about you gloss over this then. Vogtle 1 opened in 1987. Vogtle 2 opened in 1989. Since that time these plants have provided to the grids 490TWh of power, so, in units sold to the public, that comes in at 490 Billion KWh. They have 25 years worth of power still to be generated, a further 470 Billion KWH, and that’s just working on the 50 year minimum for these Nukes, which be have the facility to be extended out to 60 years and all going well, even out to 75 years. But hey, let’s just work on the 50 year minimum. So, that’s 960 Billion KWh of power in total. Vogtle 3 and 4, the units now under construction will also deliver 980 TWH of power to the grids, so all up, we have 1,940 Billion KWh of power to deliver to the grid. The plants could cost a huge amount of money, and they could still charge the cheapest price per unit of electricity generated for consumption, spreading that cost out across the huge amount of power being generated, and 50 years, even including the cost of refuels every 18 Months. Let’s do the same exercise for Wind. The same wind power Nameplate for Units 1 and 2 (2430MW) will see 4 Huge 600MW Plants with 200 towers. Over their life of 25 years, they will deliver 154TWh. Now because they only last 25 years at the absolute best case, you’ll need to double that construction, and again a delivery of 154TWH, for a total of 308TWH. Now add on a further doubling for Vogtle 3 and 4 so you now have a delivery of 616TWh all up. So the nukes with the same Nameplate will deliver 3.15 times as much power to the grids, and actually do that 24/7/365. Now, just going on current prices for a 600MW wind Plant of $2.2 Billion we have 16 of these wind plants in total, so that’s $35 Billion, so perhaps you might compare that with the cost of Vogtle 3 and 4, add on the original cost for 1 and 2, and then take into account that the Nukes deliver more than 3 times the power. Units 1 and 2 cost around $8 Billion in todays dollars, and a similar amount has been given in loan guarantees for Units 3 and 4, so here we have $17 Billion, less than half the cost for Wind, and delivering 3 times the power, so here you can see how those cheaper (up front construction) costs are spread across the life of the plant. Now, I know which of those scenarios will deliver the cheapest power for consumers, umm, and the most reliable. Those 4 units at the One nuclear plant as opposed to 480 wind towers spread across 16 separate sites. Now, I know which of those scenarios will deliver the cheapest power for consumers, umm, and the most reliable. Those 4 units at the One nuclear plant as opposed to 480 wind towers spread across 16 separate sites. I’m surprised no one picked me up on a simple Maths error. An attorney asks: Are Climate Skeptics Legally Liable for Criminal Negligence? Specific legal advice is available from Mr. Sowell and anyone who seeks such advice is encouraged to contact Mr. Sowell. I say, because it is true…blah, blah, blah….. I do believe that my question was: What can you say for wind power? You’re just another bull#### artist trying to leech onto interest for you own site. Australia has the raw materials in abundance, nuclear is safe, efficient and reliable and that makes it very competative. Without enormous subsidies neither windpower nor solar would exist as they are inefficient, unreliable have a short lifespan and are not suitable for base load production. I would rather subsidise something that works than something that doesn’t. Tony from Oz, you have presented false economics for the nuclear and wind comparison. To get a better feel for nuclear economics, read Part 3 and Part 9 of Truth About Nuclear Power. You have left out the time value of money, for one thing. For another, nuclear plants do not last for 50, 60, or 70 years. They are lucky if they make it to 40 years. And finally, the cost of nuclear plants is always escalating, while the cost of wind power is steadily declining. Wind turbines are larger and thus have economy of scale, and are at higher altitude that provides more steady and stronger wind. Both improve wind power economics. Wind power is just getting started, while nuclear power is dead and headed for the grave. It’s a common mistake, as the nuclear industry has been touting the false economics for decades. After all, if people understand the truth about nuclear power, how expensive it actually is, how heavily subsidized it is, how often the plants barely escape a meltdown, how they use prodigious amounts of precious water in drought-prone areas, then nuclear plants would never be built. Gee Roger, I live here in Australia, and I can chase down power plants in your Country better than you can it seems. Of the 65 operational Nuclear power plants in the U.S. 104 Units in all, 39 units at 24 plants are indeed older than 40 years. Wind power costs steadily declining. Please, be truthful. The costs are only going in one direction, steadily upwards. Wind power Capacity Factor is barely managing 30%. So, while Wind power is 59.6% the Nameplate of Nuclear power, Those Nukes deliver 4.7 times the power, and do that 24/7/365, something Wind Power will NEVER do, and can I make that word NEVER strong enough. You come here to this site which allows relatively free commenting, offering what is basically just your own personal opinion, and linking into your own Posts, at a site where you yourself have said you do not allow any comments. So, here we have your personal comments versus what you would undoubtedly call MY personal comments. But hey what would I know anyway? You’re a Lawyer so you preach down at us from authority. Me, well I’m just someone who has worked at the electrical trade for most of his adult life, taught the electrical trade for 6 years, and written about electrical power generation for more than 6 years. So, really, when it comes to electrical power generation, I must be pretty clueless compared to you, eh! Tony from Oz, you can not make up your own facts and be credible. Wind power is steadily declining in installed costs. I will provide documentation for you. You should research economy of scale. I write on that but you dismiss my writings so go look it up. My writings are fact-based and carefully documented. My blog allows comments and has hundreds of published comments. Each is moderated by me. As for my background, it is posted on my blog. Chemical engineer with decades of worldwide experience in world scale refining, chemical and power plants followed by a law degree and practicing as an attorney. Many of the plants I worked in built and operated their own power plants. I don’t preach from authority but I do share my experience and insights. You are angry that someone calls you out on your biased and incorrect statements. The facts have just been given to you by an expert in the industry and on the technology. At least have the courtesy to present some facts to argue your point. A law degree doesn’t impress any here. All your postings are bull####. Tony from Oz is quite correct. In fact he is being generous because capacity factor is lower than 30% and doesn’t even begin describe just how bad wind power is. Nor does capacity factor describe other system losses. For example you can’t switch the network to take advantage of every surge in the wind. What do you do when your beloved wind plants are becalmed for a month, perhaps we should just disconnect your house, that might help. Also consider the efficiency with respect to space, how much spoiled land does a genuine Terrawatt based on average (not peak) wind conditions of wind turbines take up? What sort of nameplate capacity of wind turbines would be needed to create a GW power supply that is as reliable as coal fired power? Is it even possible?, Please do tell? How many acres must be tiled with solar panels to generate a Terrawatt even for the mere 5 hours a day that solar works. Tony from Oz is remarkably good at this stuff, and where he falls down he OVERestimates the usefullness of renewable power. I can guarantee that the actual situation is much much WORSE than Tony from Oz says. Roger it is hard to accept your statement that “the cost of wind power is steadily declining”, when to be fair you have to look at the full picture. Yes it may be true that currently because of some economies of scale, wind turbines have become cheaper, but is that saving us any money? I know that your discussion with Tony is about nuclear, but your statement about declining costs of wind is just not true when compared to conventional power generation. To save money, surely they have to be able to replace other forms of power generation, and wind turbines have to be cheaper to run than other forms of power generation. Our experience in Australia certainly isn’t demonstrating that. Not even in the State with the highest proliferation of wind turbines. Overall, wind facilities amount to about 3300 megawatts of capacity, somewhat less than the single Loy Yang brown coal power stations in Victoria or Macquarie Generation’s black coal facilities in the Hunter Valley. Wind turbines produced at an average of 23 per cent of their capacity during the January heatwave. This was below their year-long average of about 30 per cent because the hot spell, as is often the case, was characterised by still air. Fossil fuel turbines are available 95 per cent of the time. Gas plants (and hydro-electricity) can be switched on and off at very short notice to fill the peaks in demand. As a result they generally earn more than the average plant on the electricity spot market. The below-par performance of windmills in high-demand periods means they not only require a subsidy but are also less valuable than other plants because their availability is reduced when they are most needed and when the price is highest. Accordingly, windmills actually earn less on average than other plants in the electricity spot market. Indeed, during the recent heat wave, wind power earned an average of $123 per megawatt hour in Victoria and $182 in South Australia while the average price was respectively $209 and $285 in the two states. Investments in wind and other subsidised electricity generation, according to the renewable energy lobby group the Clean Energy Council, has been $18.5 billion. By contrast, the market value of comparable generating capacity in Macquarie Generation coal plants is said to be only $2 billion and a brand-new brown coal plant of 3300 megawatt capacity would cost less than $10 billion. Wind aficionados claim that such costings do not take into account that wind is free whereas fossil fuel plants have to pay for their energy. But that is also untrue. Wind plant maintenance is about $12 per megawatt hour which is more than the fuel plus maintenance costs of a Victorian brown coal power station. Subsidies to renewable energy were once touted not only as a key to reducing emissions of carbon dioxide but also as paving the way to a future source of electricity that would become competitive in price and reliability with fossil fuels. After two decades of increasing subsidies, this optimism has proven to be unfounded. Instead we have seen subsidised renewable energy sucking capital into worthless investments. On present plans, a nominal 20 per cent of electricity is to be sourced from renewables by 2020. By that year the excessive cost burden on the economy will be $5 billion a year and rising. This entails crippling subsidies paid by consumers and businesses. The imposition has been a factor in the foreshadowed plant closures of Holden, Electrolux and the aluminium smelters at Kurri Kurri and Point Henry. Because of our readily available coal and gas Australian electricity costs are intrinsically among the lowest in the world. This was formerly crucial to attracting highly competitive energy-intensive industries like smelting. Now South Australians are paying the 3rd highest electricity prices in the world! Is it any wonder they are losing what little industry they had in that state? Australia could once again benefit from low-cost electricity if deregulation freed energy supply from its renewable obligations. The benefits would be especially welcomed across all agricultural and manufacturing industries that are subject to international competition. Subsidies on existing Australian renewable plants are planned to run for 15 years. But Spain, previously the poster child of renewable subsidy excesses, and now an economic basket case has shown the way forward by eliminating all previously promised subsidies. Australia needs to abandon its own renewable schemes and allow the energy market to operate on commercial terms. There have been dozens of peer reviewed papers which indicate that wind turbines will reduce CO2 emissions when taking the whole life cycle into account, that is the CO2 emissions to manufacture, install and maintain the wind turbines, versus the CO2 emissions saved from an equivalent amount of energy produced by a fossil fuel power generator. But these studies fail in two critical areas, effective life and amount of power produced over time. Most studies assumed the effective life of a wind turbine is 20 or even 25 years and they assume the same power generation efficiency throughout it’s life. This has been proven demonstrably false. Installation subsidies, I have no issues with, so long as they are backed by “deliverable” clauses in the contracts. Get a subsidy on a pro-rata basis for setting up what you say you can deliver. Same rate per unit of power delivery of subsidy for everyone. But if don’t deliver, you have to pay back the subsidy. What could be fairer than that. ps.. and let the power distribution companies have untethered choice of where they get their power from and at what price. No feed-in subsidies that favour any one type of source. I would suggest that renewables only provide 4% of our energy needs (the other 2% being historical), as dams (especially building new ones) are completely against the Green ethos. I have said before, that the most obvious ways to use the RET and other climate funds (if they can’t be got rid of)..
and build big hydro dams in the top end of Australia so electricity is available for the northern expansion that must come at some stage. The best sites for northern dams are locked up as national parks. I believe one site in northern Qld is on the drawing board. Every year around 23,000 Gigs goes over the Burdekin spillway…quite a few Megs of power could be produced by harnessing it. Where are the Fact Checkers at the ABC? ABS government statistics show that from June 2007 to March 2014 the Australian consumer price index rose by 20%, electricity prices have risen by 114%, and only a part of that was due to the CO2 tax. So Jo, when you say that the renewables industry depends on taxpayer largess, electricity consumers are paying their bills. Just ask any business owner about their rising energy costs. The RET is the hidden CO2 tax. Abolish the RET and start to make Australia competitive again. 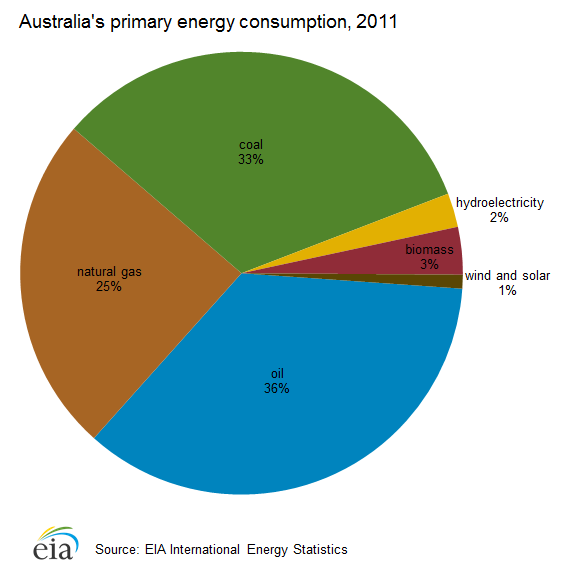 In the pie chart, biomass accounts for 3% of energy consumption. But what exactly is “biomass”? Wood burning combustion heaters? We burn wood for winter heating, it’s the only economical option in the bush; however, DEPI does everything possible to make collecting wood difficult, if not impossible. With global warming ‘not’ here yet (still only 1.4C at 9:00 am) we’ve gone through more wood this winter than ever before. A lot of it is burning of the crush sugar cane pulp that is a byproduct of making sugar. Some of the larger sugar mills can generate enough electricity through this method to supply quite a lot of power to the power grid during the crushing season. Coal – a biomass product. Burning bad. Sugar cane pulp – a biomass product. Burning good. Slightly off topic, but I wounder if there’s a parallel here. Watched a program on the Mt Helen eruption. Despite a large bulge on the side of the volcano all scientists predicted a vertical eruption all BUT ONE that is who predicted a lateral eruption. No one believed him BUT he was right and the result had devastating consequences. Didn’t do the sums but perhaps this is another case of the magical 97% consensus at work. The hidden hole card in this debate is about to be played. Without government subsidies a group called Blacklight Power has developed an energy source with a million times the energy density of the best internal combustion engine with an estimated construction cost of about $300/ KW capacity. They are about 3 months from initial production (http://www.blacklightpower.com/whats-new/). This and and other nearly developed energy sources will not only remove the grossly inefficient solar collection fields and the wind turbine farms but will soon replace coal and nuclear plants. The Greens will be totally opposed to di-hydrogen oxide powder as a fuel source. Di-hydrogen oxide is as deadly a carbon dioxide, perhaps even more so. More so – you can drink it without serious consequences but don’t try to breathe it in – it;; kill ya. The repeal of Australia’s carbon-pricing scheme — the first time a nation has reversed action on climate change — sets a worrying example for other countries mulling steps to reduce emissions. So how much does Australia’s decision to scrap its carbon-pricing scheme after just two years matter? As we report on page 392, the move was expected and may not directly affect the odds of reaching a meaningful international agreement in 2015 — but it does threaten to undermine the political momentum that has been building up and that must be sustained if the world is to get its act together on the key environmental issue of our time. A growing body of research indicates that parts of Australia, already plagued by frequent heat, drought and floods, are excessively vulnerable to climate change and its effect on extreme weather…. Abbott has won a political battle at home — but to be taken seriously abroad, he must show that he wants to serve his nation more than he wants to appease the fossil-fuel industry. The main problem here is that people believe what they want to believe, and no amount of explanation will alter their belief. You can explain it all till you’re blue in the face, but they WILL NOT believe that renewables cannot do what they are claimed to do. Concentrating Solar Power (CSP) or Solar Thermal Power as it is referred to is the biggest case in point here, because this is being pushed as a method that CAN replace large scale coal fired power, and supply 24/7/365 power for an absolute Base Load requirement. It can’t, and no matter how many times I explain it, very few people will believe what I say. The problem is with the generator itself, the rotor in fact, and its huge weight which has to be rotated (driven) at such fast speed, 3000 RPM (3600RPM in the U.S.) or rotated at 50 times a second. The larger the power output, then the larger, and heavier the rotor, and everything goes backwards from that. The size of the driving turbine, a multi stage (usually three stages) turbine. Then the steam required to actually make that turbine move enough to provide its driving force, steam at extremely high pressure, and high temperature, so now we have a steam pressuriser as well. Then to boil the water to steam we have the compound (in the case of CSP, molten salts usually) itself which has to be heated to a molten state enough to make the steam from water. Then the tower itself, getting the compound up to the focal point and then back down, a constant circulation. Then the mirror field to focus at that point on the tower. Then movable tables of mirrors that align to best follow the path of the Sun all throughout the day. So, here you have a large number of things, all working backwards from the weight of the rotor which has to be turned. More than 6 years ago now, I started doing this, and I chased down as much information as I could on what was required to make all this work ….. on the scale required. The best CSP at the time was 50MW and that was only being driven on a daylight only basis, no heat diversion at all, so the compound had to be brought up to the molten state enough to make steam, etc etc down the path of power generation. Heat diversion is a trade off here. If you divert some of that molten compound for out of daylight hours, then you lose the ability to use ALL of the compound to make greater amounts of steam to drive etc etc. So, that meant, if they were to include different levels of heat diversion, the trade off was lower power generating ability, a smaller generator, now able to be driven for times outside of daylight hours, 3 hours, 6 hours, and 15 hours (the hoped for 24 hours all up) and to achieve that full 24 hours of power delivery, the generator now became only 20MW, a piddlingly small unit really, but it did achieve the full 24 hours of power generation, albeit for 20 days or so in Mid Summer only, and then back to lesser times as Summer passed, and in fact, closing down fully in the Winter. So, see here the trade off. 20MW if you have full heat diversion and up to 50MW if there is no heat diversion. You’ll see plants up to 250MW, but they have 5 small 50 MW generators. Ivanpah in the US has one of the new 125MW turbines capable of driving a single unit of 125MW, and again this plant has its troubles let me tell you. There is no heat diversion at all, so the plant just operates during daylight, and has a very poor rate of power delivery. OK then back we go to the more than 6 years ago when I started looking at all this. I found a paper written three years earlier, in 2003, a 344 page pdf document which I trawled through looking for information. The findings were (in 2003 mind you) that while 50 MW was the norm for that time, they were sure that a single unit of 250MW could be viable in 5 years (then 2008) and a single unit of 500MW could be viable in ten years (then 2013) and with the capability to have full heat diversion for 24 hour power generation all year round. So, here we are now in 2014 with one unit of only 125MW being operational, with no heat diversion and still only 20MW with heat diversion, both still problematic. Explain this to green believers and they just DO NOT want to listen. They won’t believe. That’s why it gets pushed as being viable, by clueless people who won’t find out the facts and won’t believe them when they are told. The same applies with PV panel generation. There’s always a magic new battery just around the corner, an all singing all dancing 100% efficient humungous storage capability, and at a cost of 1% of existing batteries. People WILL believe that. The same applies for Wind Power. People believe it is perfection personified. The same applies for Geothermal power. You cannot explain to people that it works well in someplace where it is being used, and not here in Australia. The someplace where it does work, well the thermal field is ten times closer to the surface than it is here in Oz. Every renewable has failures which are easily explained, but you see, no one wants to know. A big thumbs up for that Tony. And one day there will be many who will think but few who will admit, We were told but we were too damn stupid to listen. Wishful thinking is the term you want, which is ruthlessly exploited by lobbies for these schemes. We’ve all encountered the gullible starry-eyed loons touting and linking to the advent of baseload solar, proclaiming “But it’s here already!”, etc. And always said dupe has been reading green-power lobbyists pumping their utopian best-seller snake oil solution via their latest multimedia extravaganza. And we only have to get on board and invest a little, give them a worthy leg up (this is an emergency after all, time is of the essence!!!) and a new world filled with sparkling fluffy yellow puppies and rainbow-backed fields of green will alight upon us and anointing us with beneficence and unsolicited miracles. Then you get the power bill, the tax bill, the propaganda bill (ABC/SBS), the load-shedding induced rolling blackouts as the entire manufacturing base packs up its tent and buggers-off (see Tasmania) to where there’s more industry overhead (actual base-load capacity) and fewer self-harming wishful-thinking utopian drongos (see Christine Milne and her erstwhile antecedent). Any private solar plant operator (if there were such soft headed fools in Oz) that had to purchase the plant themselves, then try and make a profit to recoup their investment, plus pay employees and maintainance and earn enough to replace the plant in service to maintain continuous supply (assuming it actually worked, as advertised, which you neatly showed, it doesn’t) will surely go broke. And they should. Any person in business who does not lok before they leap, must be culled via bankruptcy. That is what regulates and halts the tendency to stupid. But subsidies do exactly the opposite, they make people stupid and ill-equipped for actual business competition – so they constantly demand … protection money! But we actually do have a lot of small private installations in homes, and as the economic reality of the failure to recover investments before the big-ticket replacement items must be bought (batteries and inverters for instance and eventually the panels, mounts and DC cables etc.) they may have less money at that point, especially as subsidies are removed, and they discover to their horror that household solar can have many hidden running expenses. Right now solar companies are advertising cheap installations at around 2.50 per watt. So a lot of the early adopters from over a decade ago are going to get a shock if the subsidies suddenly disappear, which currently support the ‘LOW’ $2.50/watt level. Then the replacement cost of solar actually goes up, steeply! Not the downward socialized losses trend they had expected. So they either continue with the wishful-thinking and stump-up the cash and suffer this added cost burden themselves, for once (in embarrassed quietude), or else turn the mains back on. So if a major component fails without warning many of these nominally solar supplemented home supplies are going to very quietly switch the mains back on … and never speak of it again! Welcome back to reality thou wishful thinking nugget. George of the Infingen company (offshoot of the infamously bankrupt Babcock and Brown bank) actually hopes to be taken seriously about his “green” jobs! It’s like reading something from Al Gore’s playbook of years ago. He has recently admitted on the ABC that 40% of Infigen’s revenue comes from the iniquitous Renewable Energy Certificate subsidies. 40%! This huge loss of money from our economy goes where? Overseas mostly, to “investors” who can’t believe both their luck and the monumental stupidity of Australia. A veritable pipeline of money, jobs and development opportunities out of the country. The so-called “green” jobs are the same jobs which cost over double the loss of real long-term jobs, be they in manufacturing or associated industries. Yet these wind companies have the utter gall to try to hoodwink the population about “loss of jobs” when wind gets booted out. 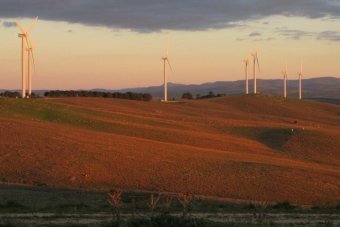 When will the ABC remind us of the loss of jobs caused by wind turbine companies? When will they visit the disasters of Spain or California to see 27% unemployment (Spain), much of which can be attributed to wind “farms”? South Australia is mired in the scam; it’s no coincidence the price of electricity there is almost the highest in the developed world (a fact the wind apologists have recently been shamefully trying to bluff about). The 47% Labor government in SA outrageously allows wind turbines just 1 km from residences; as a result, companies like Infigen have indulged in the rank incivility of planning more “farms” in closely settled rural districts, flanking towns, rural residences and tourist areas. Only a handful of grasping LINO rent-seekers are needed to sell out a district, not to mention their neighbours. A removal of the the RET will go a long, long way towards cleaning up this dangerous economic, social and environmental cancer. And just on Monday, Petratherm abandoned plans for geothermal electricty generation at Paralana in the outback of South Australia. A ‘funding shortfall’ was the reason given. ABC radio coverage made it clear that the company had expected further government investment, which would always be needed to make any project of this type viable and attract private investors. Their technology for harnessing geothermal energy may be sound. But there’s no future in producing electricity so far from any centres of population unless government provides a transmission network. Which is them attempting to not honestly admit that commercial generation and transmission is not viable and won’t be with current transmission technology so no financier will go near it. It requires a breakthrough in cheap superconducting transmission technology, or else an incredibly deranged government and a shed full of stupid. So if the greens ever got in power it’ll go ahead for sure. There’s a 97% chance that politically-favoured projects which are from the outset understood by those with an appreciation of numbers to be doomed to fail; will be subsidised until the cows come home. And then quite a while longer! Nonsense is subsidised when it fits the political rhetoric. Flannery and George were recently on the local ABC radio peddling bovine excreta about base load power being able to be generated from windmills and solar panels. They must be getting desperate to be peddling such blatant misinformation. If one was dyslexic then 96.9% would read 66.6% – a bad omen because the beast is from a very hot place. While on this “hot topic” perhaps “Warmists” must suffer from a form of selective dyslexia, ie when it is cool it is warm and when it is warm it is warm. Protesters interrupted Bill Clinton’s speech at the Aids conference in Melbourne wanting a “robin hood tax” on the wealthy to be on the agenda at the G20 summit, it was all organized of course but it shows how far this cult of activism has spread and accepted. Considering the obscene amount of money (highlighted here) that is wasted on obsolete environmentally damaging technologies you would think these activists would be outraged at the depravation of life saving, wealth generating, constant base load power sources for the most vulnerable people on the planet. But no, these are people so blinded by political hatred they prefer to justify turning to Eugenicist ideals where those other unfortunate people have to be kept poor for the good of the planet, it’s all good for them being well fed, well housed, well paid and not one of the unfortunate, but they’re going to protest for a handout so the unfortunate get temporary relief until the next disaster strikes. Why would you want the unfortunate to have a way out of the poverty spiral when you can play god and impress every other dolphin humper on Facebook? Any ex POTUSA worth their mettle would have pointed this out but were talking about a treasonous UN sycophant that thinks this is just fine and dandy. I see the ABC today is also giving free advertising to the US based anti-coal group Institute for Energy Economics & Financial Analysis . According to 2012 figures China produces 81% of its electricity from coal and the 66% figure is coal’s share in the total energy mix.The world average for total energy is approximately 30% the highest ever. This is not the first time your ABC have used this groups incorrect reporting. Meant to also comment on Buckley’s false concerns about the Australian coal industry. Does he realise that China produces 3.5 Bt/yr and imports a piddling 289 Mt/yr in total. Very little decline in export tonnages just the price is not what is was at its highs in 2008 and 2011. EU commissioners are meeting today to agree an energy savings target for 2030 amid serious disagreement about how ambitious it should be. Several countries, anxious over the security of their Russian gas supplies, are pushing for a tough, binding goal. But EU officials are reluctant to agree because they fear it might damage the overall energy and climate package. “It’s a very strange debate,” said Brook Riley from Friends of the Earth in Brussels. “Because they are setting a limit on the cuts, like a lid on a saucepan, they are forced to limit energy savings and renewables to avoid damaging the emissions trading system. The most recent leak from the outgoing Commission showed that officials were planning a non-binding goal under 30%. However the President-elect of the incoming Commission, Jean Claude Juncker, has added his voice to those in favour of higher ambition. Mr Juncker told the Parliament that “a binding 30% energy efficiency target is for me the minimum”. “Can we do more than already proposed in the field of energy efficiency without destroying the whole basis on which our 2030 package is presented?” she told BBC News. poor Connie. her remarks are almost incomprehensible. They (European leaders) are reluctant to get tough, much more so than the United States. The EU could easily end up doing itself a lot of economic harm, most obviously if Russia were to respond by turning down the gas. Russia is a very important oil exporter too, though that is a more liquid market – to coin a phrase – where it is not so hard to find alternatives if you fall out with one major supplier. (Russia) is an important supplier of the raw material for nuclear fuel, uranium. There is an international market for uranium, so there are alternative sources, but Russia accounts for 18% of EU supplies (behind Kazakhstan and Canada), so switching is not that simple. Second, there is the business of enrichment to make the uranium suitable for power generation – and 30% of this work is done by Russian companies. It is worth repeating one point. Gas is the big issue for commercial relations between Russia and the EU – but nuclear energy matters too. ‘… the Australian Broadcasting Commission’s Mark Colvin said in 2007: “before that vote [the 1967 Referendum], Aboriginal people weren’t counted as people, they came under the Flora and Fauna Act.”. This statement is not correct. The 1967 Referendum did not repeal any such “Flora and Fauna Act”; indeed, no federal legislation existed under that name …’. The total emissions from the EU energy sector fell modestly in 2013 but the campaigners say the rising use of cheap coal puts the EU in danger of not meeting future climate targets. The price of pollution permits in the EU’s emission trading scheme remains far below the level which would make it more economic to use gas, which produces about half as much carbon emissions. ***According the International Energy Agency, the share of coal in EU electricity generation must be below 4% by 2035 but is currently about 25%…. why didn’t Carrington write that the report is by Panda Org? the “panda” out of favour these days as a propaganda tool? This report was researched and written by Kathrin Gutmann from Climate Action Network (CAN) Europe, Julia Huscher from Health and Environment Alliance (HEAL), Darek Urbaniak and Adam White from WWF European Policy Office, Christian Schaible from the European Environmental Bureau (EEB) and Mona Bricke, Climate Alliance Germany. given the crowd at this Californian event, i’m surprised a couple of sane voices were heard! Africa has experienced massive economic growth over the last decade, but in order for this growth to translate into significant development outcomes, big investments will be needed to provide electricity to the 600 million sub-Saharan Africans who lack it, said a panel of development experts at Breakthrough Dialogue. Given their high cost and a lack of infrastructure to support them, at least in the near-term, renewable technologies like solar will not be able to power Africa, argued Asafu-Adjaye. Renewables may become useful in the medium-term, but only once significant investment is directed toward new power plants and rehabilitating old ones. As the US Executive Director of the African Development Bank, Alemayehou oversaw the proposal for the Gibe dam project, which planned to double the installed capacity of Ethiopia. Rising pressure from environmental groups like International Rivers, heightened by the approaching Copenhagen climate change conference, ultimately forced the African Development Bank, the World Bank, and the European Investment Bank to withdraw funding from the dam. In the end, the Chinese funded the project. ABC listeners come away misinformed. Then they will no worse off than they were before. Some might ask why would you spend anytime at an echo-chamber like the Conversation. The entertainment is in watching a bunch of clueless greenie heads exploding. But, sometimes, you get an extra bonus. Here is one such time. The Conversation is is an arm of the Murdoch Press? I guess that’s getting value for your tax dollar. It varies greatly between turbines and locations but about the equivalent of 13% of the actual power produce by wind turbines, not the hyped up, totally spurious plated capacity that is the so beloved quoted propaganda of the wind turbine industry, is used by the wind turbines to keep their systems operational, their electronics running, turning the blades to prevent major main bearing as well as the Composite blades distorting under the weight of the blades, turning the nacelle and blades to always face into wind and etc when they are not producing power or enough power to power themselves. This 13% equivalent of their actual output is drawn from the grid when the turbines are not operating. Whether they ever actually pay for that grid power has never been revealed and it might just be another freebee all at our expense of course. And another bit of info nobody thinks about. It has recently been calculated that the information, telecommunications, computer and data storage industries now use around 10% of the global energy output to run and operate. So whenever you see a green dyed latte sipper busy using their laptops, smart phones, tablets and etc and etc just remind then that by using all that latest fad gear they are contributing at least 10% to the global CO2 emissions. I will leave the potential horrific consequences in the Australian context of this next item to your imagination. And most Australian turbines are still relatively new and have just started experiencing major problems as they start to age. Others (LOP, short circuit, etc.) accounted for 28.5% of claims. Caithness Wind Farms have compiled a detailed report on wind farm accidents throughout the UK and Internationally, by sourcing news articles, accident reports and insurance documents. Fire is the second most common accident cause in incidents found. Fire can arise from a number of sources – and some turbine types seem more prone to fire than others. A total of 185 fire incidents were found. The biggest problem with wind turbine fires is that, because of the turbine height, the fire brigade can do little but watch it burn itself out. While this may be acceptable in reasonably still conditions, in a storm it means burning debris being scattered over a wide area, with obvious consequences. The consequences if a turbine fire started on one of those 43 degree days in SE Australia with the usual strong northerly winds blowing. are almost beyond description. And as the wind turbines are installed over ever more country the chances of a major turbine started fire occurring is becoming inevitable. It will be the rural and country people who don’t want those damn turbines in any case who will both cop the devastation of such a fire and who will be the ones who have to fight that fire in the terrible condition such fires create while the predatory wind turbine carpet bagging investor rip off merchants all sit safe and sound in their Air conned offices in the safety of the big city and figure out if the insurance will cover any financial loss. they might suffer. If the odd politician or one of his advisers is reading this the obvious solution to the turbine originated fire disaster situation would be legislation requiring turbine owners and operators to take out insurance that is sufficient to cover ALL liabilities they might incur from turbine started fires and any other destructive causes that can be sheeted home to wind turbines and their operations and operators. This is the only just case for rural and country folk who have to bear the entire financial, economic and community and personal consequences when and if a turbine creates a fire disaster so all embracing compensation should be a mandatory requirement for any and all turbine farms owners and operators and be legislated for by the state and Federal governments. I reckon a half a billion dollars minimum insurance policy with a maximum number of turbines per policy, say half a dozen turbines per policy and updated in line with the inflation index should be close to the required insurance sum. Failure to adequately insure and then have a turbine created disaster would be a mandatory jail sentence for the CEO and directors of the turbine owning and operating companies. That should make them think again. The European Commission on Wednesday agreed to outline a 30 percent energy savings goal as part of a package of climate and energy policy for 2030, an EU source said on condition of anonymity. 3) Is wind the best solution? NOT! The OECD nations around the world have done a colossal screw up and disservice to the public by jumping on board with the fanatics and evangelists and this has been augmented by all those who privately profit from this mess while the public pays through the nose. The EU commission on Wednesday (23 July) tabled a plan to increase the bloc’s overall energy efficiency, but had to water it down amid fears of Russian gas supplies being cut in the ongoing Ukraine crisis.